Is that a rock I see before me? Will it be my friend? 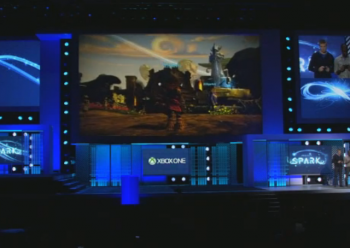 Project Spark, the handy dandy game creation engine coming to Xbox One, will let you do pretty much everything, from putting brains in rocks - so they'll be your bestest ever friend - to sculpting the game world from the ground up, setting the geographic zone, or time of day. "This [development] team came together with one purpose," says Microsoft's Dave McCarthy, "to give the gift of games to everybody", by putting game creation in the user's hands. You'll be able to share the game with anyone, "on any screen," according to McCarthy, who made much use of SmartGlass during the presentation, and Windows 8 integration is also a feature. The demonstration took development from pretty much nothing to a colorful jungle setting. "In just one minute we were able to make something that looks great," McCarthy said, and then they started putting brains in things - adding personality through subroutines - before summoning up some goblins for the player to deal with. This will be a creator-driven experience, and - judging by the demo - you'll be able to adjust anything, including terrain, on the fly even while the action's rumbling away. "There are an infinite number of ways to play, build and share," says McCarthy. "Think blank canvases, or story creation, or taking someone else's creation and building out your own." One to watch! If it delivers on its promise, Project Spark could really spark the imagination of players everywhere.